Posted by Virginia Nussey on 08/18/2011 @ 1:50 pm | Comments Off on Search: Where to Next? I’m blogging this one on my iPad. It was my hope I’d be able to do that all week, but SES has no tables and so no where to put my roll up Bluetooth keyboard. I’m using the laptop as a typing surface. Bryan Eisenberg just showed me the WordPress iPad app. It looks simple. I’ll have to get that sometime. I’m just in the browser right now. Anne’s doing intros of the panel. They’ll each get 1 minute to set up their topic. Rand: Content engineer is where left brain and right brain meet. He wants to put numbers to words. Eli: He’s going to talk about market research, trends, stats, the quantitative guy. Dana: Stats we see in terms of clicks and traffic are inefficient. A lot of people don’t click. There’s a lift in awareness, and no credit is given to it. Search is broken until we destroy it and build it again. Tamara: She’ll talk about he transformation of search due to mobile. She describes the future of search as fragmentation. Anne wants to start with mobile. She asks everyone to talk about the mobile app economy. T: When consumers use their mobile device for search they have an immediate need to fill and are at the end of the purchase cycle. Over time, we’ll see PC search as research, and mobile will connect a customer with a business at the time of need. There’s a common challenge in monetizing apps. E: Different types of mobile devices. Search experience on a tablet is different than the mobile phone. Tablet device search mirrors laptop or computer. Soon you’ll see targeting of ads based on device. 14 million tablet users in the U.S. Not every device is created equally. Query length on phones are shorter than on tablets and PCs. M: Shift – There’s a ceiling on the Web’s usefulness. The app economy is about sidestepping the Web. D: Qualcom wanted to get carriers to open up. They argued that apps were a workaround for what wasn’t available on the Web. R: Unless there’s enough relevant content on the Web, there wont be anyone on there. Creativity without conversion = ? (waste, art, branding – called out answers) He says it = 0. We need people creating content for mobile, web, etc, to have tools to create relevant content while they’re creating it. English majors can’t count and counters can’t spell. All content on the web should be created for biz purposes. E: We all took a course about formatted, structured writing. Teaching structure that is esoterically functioning for sharing or finding. M: He’s managed content developers and always asks what is content? Compelling content? Or for a robot? R: Writers today don’t know about targeting, segmentation? If you want to be an artist, put it in your diary under your bed. On the Web, it’s relevant content to be found and shared for business. 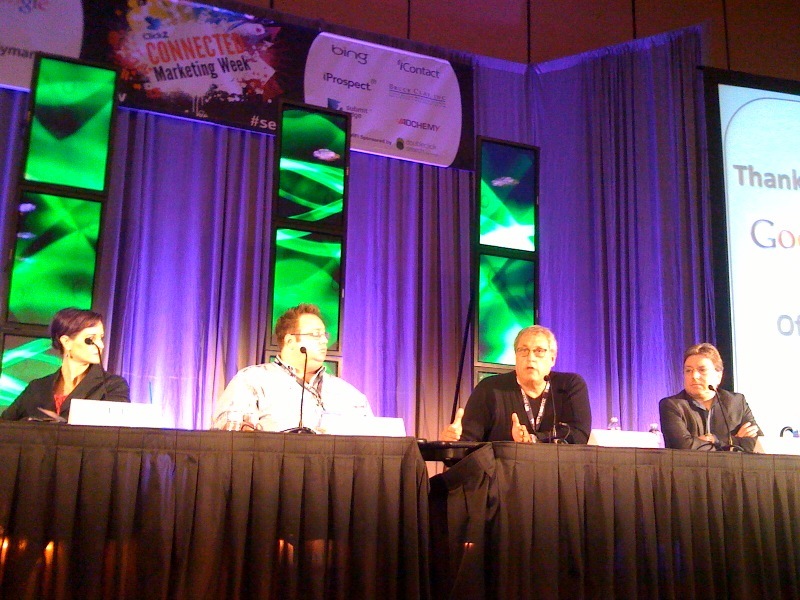 A: Is there a merging of content and the app economy? M: The app doesn’t need the web to work. There’s crossover. The web is a sea of crap and the notion that Google’s able to make sense of it is archaic. Maybe Google should think of this. Search for a Yankees score. Search about a player. Why does he have to keep asking as a squiggly thing chases it down? D: We started seeing excitement on the Web with social media and Web 2.0. There’s no excitement in mobile. T tells R he’s not thinking of marketers who are writing with a conversion in mind. R: Who’s responsible for creating that content engineer? It’s an innovation problem and in the next year or 2 he expects curriculum around creating content thats consumable by apps and media. D: The content engineer is a better title than SEO, but it doesn’t go far enough. We try to understand intent. We’ve enabled experiences, not just content, and we need to take into account the exchange and exploration. What’s your emotional conversion? R: How do I optimize an emotional conversion? D: There’s a whole science around it. A: What’s the implication for us trying to make a living as a promoter? Sorry – 5 minute lapse of coverage due to technical difficulty. T: The device will change the search experience. When your product requires in-depth research, a call is often part of the process. We need to think of how search translates to environment to environment. D: People are using phones in their downtime more. Usingi them when they’re bored or want to look like they’re not doing nothing. Tech changes are enabling a reverse. PCs used to be about surfing. Then it became very task oriented. Mobile started as task oriented and now it’s moving into the fun zone. A: Is mobile a direct respose medium? T: 62% of people who search on a phone call a biz. A biz wants a phone call to their biz as the number one outcome they want. T: The pendulum has swung. We used to try to keep all transactions online and we saw loyalty drop. There are a lot of bizs that need phone contact to upsell. The human connection is very important to getting customers to trust and repeat. D: Data in suppot: Call centers are up for the first time in a decade. R: There are some verticals where it doesn’t make sense to optimize for calls. E: There will be better analytics related to the type of biz and what online marketing investment is right. It’ll take time. D: Let’s change topic. Why isn’t anyone doing barcode search? It’s been bugging me? Scan a barcode with your smartphone. It may take you to a price comparison. It might take you to Google Product. It may or may not be optimized. Why aren’t retailers talking to barcode manufacturers to have barcodes optimized. Reviews, price comparisons, there should be a more robust experience. It may be better to do this with QR codes since retailers would have more control. Audience: RFID will be smarter since you don’t actually have to scan, which is a step that a consumer might find a hassle. D: Social operating system is being enabled by social and mobile. R: Who’s responsible for making sure the right content is there and coverting? Best Buy has an analytics group that services marketing and merchandising. We need to start teaching about environmental factors of conversion on the Web. Audience: It won’t fold into one course for an ultimate facilitator. It’s about collaboration. D: If you focus on creating a good participation level of your potential consumer, it’s better than keeping different roles in silos. It will cause the collboration conversation totally different. E: Branding will drive enormous growth. Social media is earned marketing, it’s not owned. Search results include Facebook and Twitter profiles so enhance social media outlets which influences your own pages. R: Create a video but make sure there’s a transcript that’s searchable. D: Video ideas are baked into her client services but there’s still a hurdle for businesses accepting they should create video. E: How to is a big search phrase for video. As soon as blended results come up, more often than not a searcher stops typing. People have an emotional connection to things they see and hear. As brands move online, there’s enough analytics that we can see what the emotional connection is made. You can quantify these things. M: In 2005 Google knew they’d never be able to crawl all the Web. UGC beats mediated content by factor of 5:1 in crawl rate. Encourage that kind of content online as an SEO strategy. Audience: Comment on findabiity of non-text content. Bryan Eisenberg: We’re still stuck thinking of the current role of devices. But we can’t even think of what it will be like in 5 years. M: Tech in the future will involve chips in our brains. People will think of other ways and means. E: Do the letters SEO go away? Audience: We need to remarker ourselves. E: Regarding the change in paradigm, the direction is a battle between tech companies ad consumers. The personalized experience of using the conneced world with you is going to drive the changes. It’s a personalization revolution. T: Consumers will drive the future of technology. Whatever’s the new tomorrow will have to be monetized, eiher by susctiption or allow for advertising. D: There’s a high saturation of people playing social games. There are more creative things we can do. We can tie experiences to this. R: The future is creating greater relevance for everyone, whether if used for working or playing, either way it creates options. M: Privacy issues, being able to share more info with info protected to create a richer experience, maintaining privacy and protection necessary while getting the info we need as marketers to provide a rich experience.